Since the last chapter we have moved to the town of Akeley, purported to be the home of Paul Bunyan. 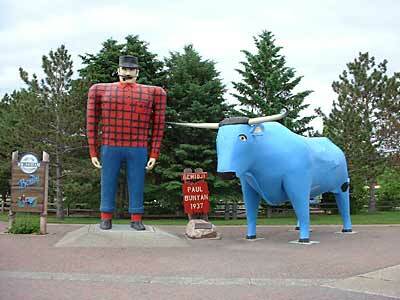 However, as you can see Bemidji also thinks he and Babe the blue ox were born there. 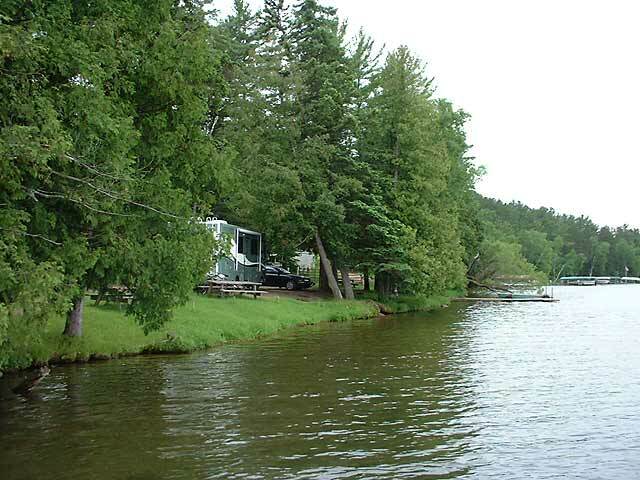 The city campground was on 11th Crow Lake. We could watch the loons in the evening fishing for their dinner. On the weekend the camp was full but during the week we it all to ourselves. Adele and Judy went back to Itasca State Park after a disastrous day of trying to hike from west to east. 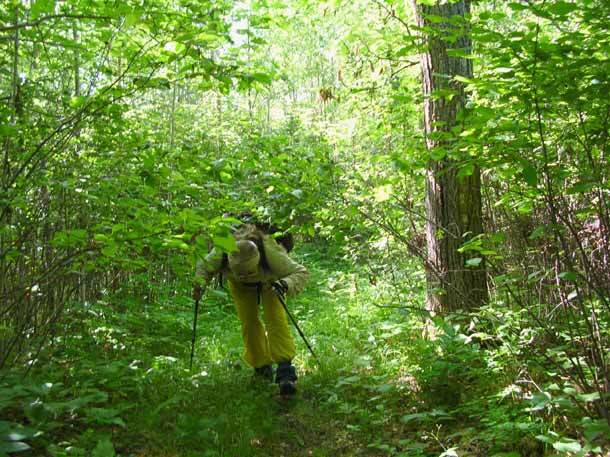 They hiked east to west on the state park maintained portion of the North Country Trail and came out in a loop rather than face another day fighting the poorly maintained section in the west. 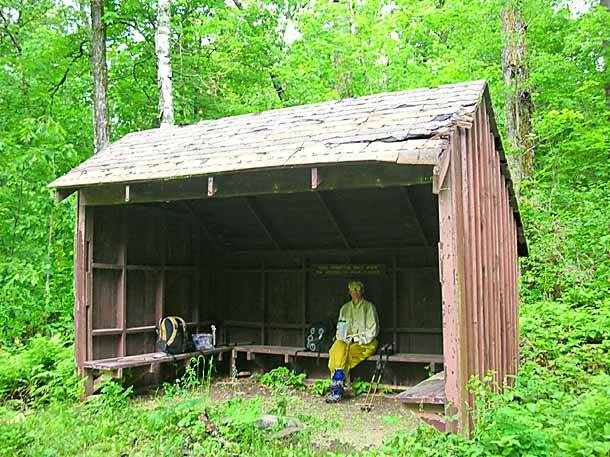 This is the first shelter we encountered along the way since starting in North Dakota. After some days of road walk on forest roads that were as difficult as the trails since both had blow downs and were difficult to access as well as to find. John had to use a chain to move this blow-down that was across the road. 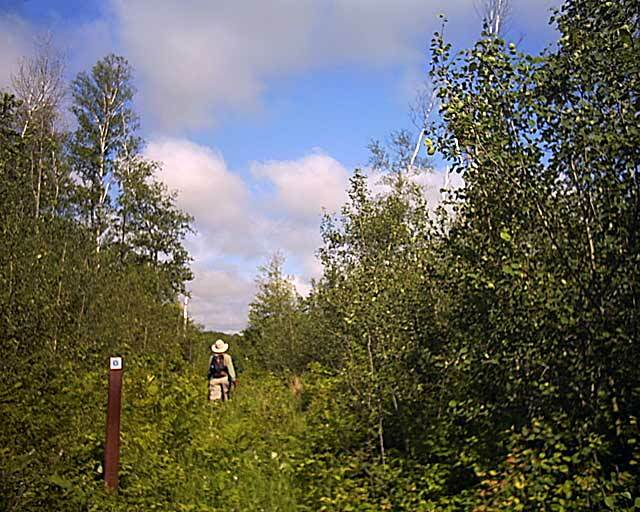 Maps in these sections were incorrect as to the location of forest roads and position of the trail. All of this contributed to Adele and Judy feeling frustrated and angry each day at the end of their hike. Clear cuts, non-maintained trail was tiring and beginning to be not a fun way to spend their time. 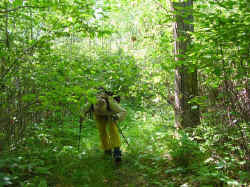 Anyone with full packs would have been permanently crippled from the constant bending to by pass low hanging branches. 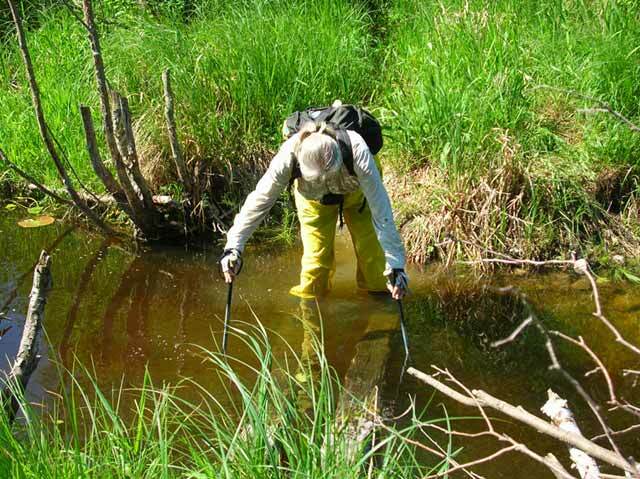 The temperature had risen but due to the increasing amount of vegetation, ticks, and mosquitoes the dress of the day was long pants, gators, long shirts, and a ton and a half of l00% deet. 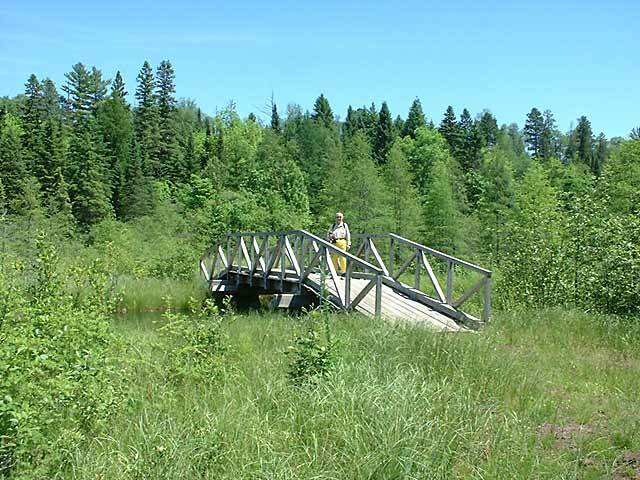 One bright spot in the Chippewa National Forest was a unique bridge system. 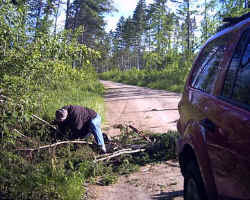 This area by the wooden bridge was done in l979. 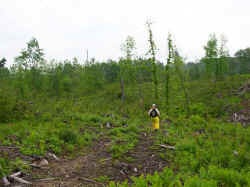 In the winter when the bog was frozen they laid logs and then tied them together and put sod on top. Supposedly it is 20 feet deep under the bog bridge that looks just like a raised pathway across the Anoway Lake outlet and marsh. Adele and Judy then hopped on their bikes and did the road to Grand Rapids. 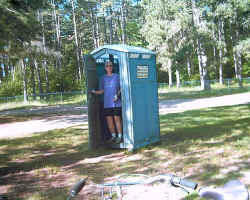 As usual Judy could not by-pass the porto-let on the way to Grand Rapids. 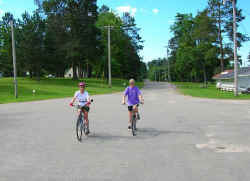 They ended up at the Itasca Fairgrounds and the beginning of the Mesabi Trail that will be their connection to Ely later. 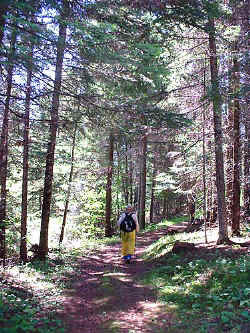 At this point because of a shortage of time , we will jump trail and start on the Superior Hiking Trail. It starts in Two Harbors and goes north along the shore of Lake Superior.
. 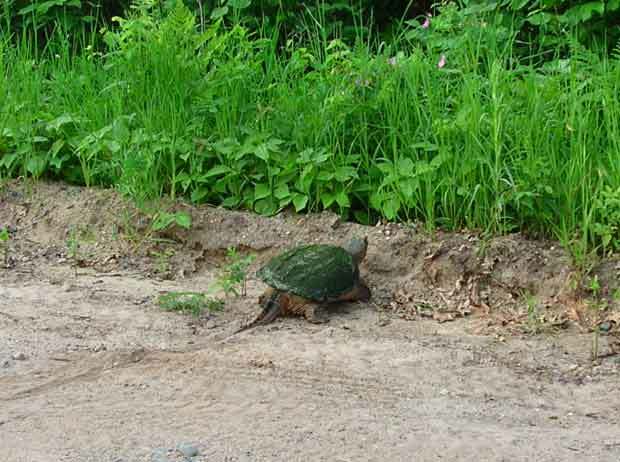 Along the way we spotted this big snapping turtle. 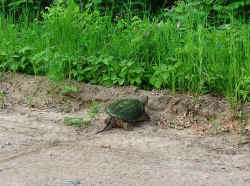 Judy usually will run onto any highway to move a turtle out of harm’s way. However, in this case the huge snapper was on his own. The only bright spots besides the biking in this area was the spotting of a coyote and bear while hiking. 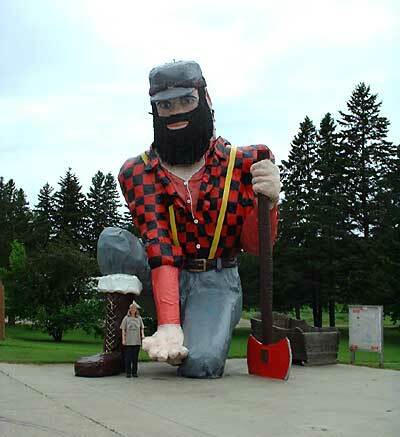 Bob and Judy also found great dining in Park Rapids at a German restaurant called the Schwarzwald Inn. The special was baked pork hock with noodles and red cabbage. Judy had walleye. We had enough for two meals. We also spent one night camping in the casino parking lot outside of Walker. They have electric hookups and don't charge anything. We did go in and play the penny slots. Being big spenders we lost $2 each. We have now moved to Two Harbors, MN, just north of Duluth, on the north shore of Lake Superior. More info in the next chapter.